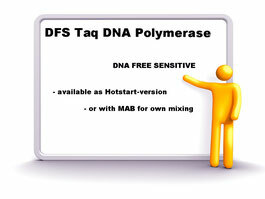 DFS-Taq "Hot" is the "Hot-Start PCR" version of DFS Taq DNA Polymerase that provides a new formula in buffers and additives to prevent failures in PCR-applications were inhibitors (e.g. proteins, fat or PS) reduce the performance. The Taq Polymerase is blocked with monoclonal Antibodies. 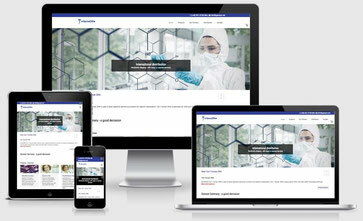 Both components, the Taq Polymerase and the Antibody is available, separatly at GeneON's shop. 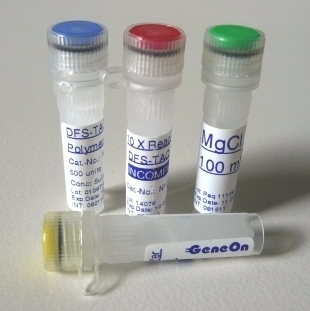 Instead of conventionally purified Taq-DNA Polymerase for sensitive PCR reactions, for the detection of bacterial DNA or for applications where inhibitors decrease the performance of regular polymerases. Transport: with "blue ice" or at ambient temperature.